Snow Queen Rabbit Fur Blanket is feels very soft, the hair is thick and radiance, color is consistent.Our Rabbit Fur Blanket decorates your sofa, bed, or loveseat with the beauty of rabbit fur. Warm and silky soft, lay it down by the fireplace for that well earned plunge into downtime. This blanket begs to be used and displayed, and brings a soothing feel to any room.Genuine Rabbit Fur Sections. Swipe up and rear of the fur by your hand, if you feel very soft and smooth and not find bald or dim color, this kind of fur is good fur. Wholesale natural chinchila color rabbit fur blanket is no odour. Look the product work, good quality fur the fur knife edge area is neat and smooth, the seams of the strips is tight and neat. 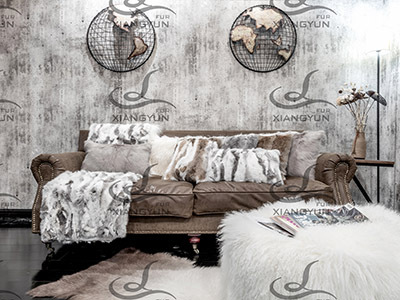 QINGTONGXIA Xiangyun fur and leather CO.,LTD. was established in 1984. Which is located in the Qingtongxia city of Ningxia(Northwest of China near Mongolian). Thanks to the resource advantage of local Lamb Fur, We developed rapidly and has the most advanced equipment as well as the largest scale in local area, including developing, tanning, dyeing, cutting, sewing, packing and delivery. We process 500-800 thousands lamb skin per year. 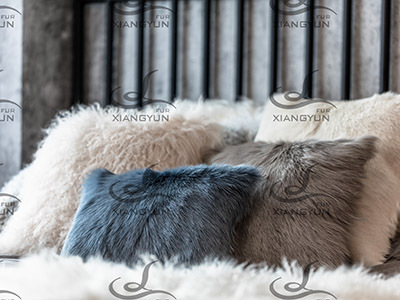 We Main produce Tibetan lamb fur(Mongolian fur), Goat fur, Rabbit Fur Cushion, rug, carpet. We main export to Europe, USA, Canada. For better develop, quality, service, delivery we built Zhejiang branch factory in 2003. Welcome to our factory for better develop and cooperation! Company Name: QINGTONGXIA XIANGYUN FUR AND LETHER CO. LTD.